Since its discovery in 2004, researchers have been exploring 2D electron gas due to its unique electric properties and how it could be of use in superconductors, actuators, memory devices, etc. Its uniqueness lies in its ability to exhibit conductivity or electron mobility in two dimensions, but tightly confined in the third dimension. This restriction in mobility makes the electrons appear to be a two-dimensional sheet embedded in a three-dimensional world and results in quantized energy levels for motion in the third direction. 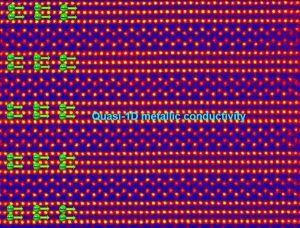 According to a recent study published in the journal ACS Nano, Japanese researchers at Tohoku University have identified the atomic structure of a metal oxide exhibiting quasi-one-dimensional metallic conductivity. The perovskite-related metal oxide called strontium niobate has a layered structure consisting of strontium, niobium, and oxygen atoms. Using a scanning transmission electron microscope (STEM) and theoretical computations, the research team observed how oxidizing the strontium niobate compound could affect the material’s conductivity. It was found out that depending on the concentration of oxygen atoms added to the compound, four different types of structures are created. Three of these conduct electricity, while the other one is an insulator. The STEM is a scanning probe microscope that has a very high resolution – that is, at the atomic scale. It results in images that are formed by scanning a beam of electrons passing through the sample. Under this microscope, Yuichi Ikuhara and co-researchers observed that the materials synthesized after oxidation are made up of alternating chain-like layers and zigzag layers, as shown in the image above. For all of the four structures or materials synthesized, their zigzag layers were their insulating part. On the other hand, the chain-like layers of the three (out of four) were found to be the conducting part. In addition, the researchers also found out that thicknesses of these layers were also dependent on the concentration of oxygen atoms. Each layer is composed of repeating unit cells called niobate octahedra, and the structure or shape of which dictates the local conductivity within each of the four materials created. The local conductivity occurs when positive ions of niobium go toward these octahedra.